this afternoon i went to buy some gloves (it’s getting cold at work you know :-). coming home i noticed that they have a normal label and a supplementary qr code (german) sewn into them. since i couldn’t find a decoder for os x (the java-version of the one urs  found doesn’t work for me), i kindly ask the blogosphere if they can decode it for me. i’m just wondering what adidas is writing in my gloves. additional images (and an extreme closeup) can be found on my flickr-page tagged accordingly. 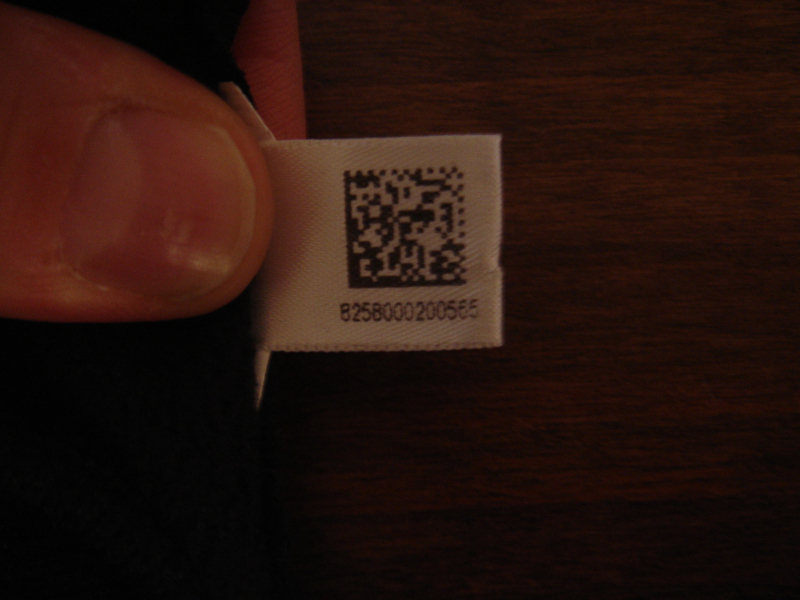 qrcodes have 3 distinctive squares in three corners of the code, whereas datamatrix codes have a L shaped border along the left and bottom border. It might be a Semacode . Maybe it will decode something useful if you achieve a better contrast like plain black and white. The brown/yellow background might be a bit of a challenge for the decoder, but that is just a guess. It’s definitely Datamatrix (RVSI Acuity CiMatrix (USA)).